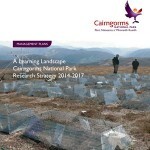 The Cairngorms National Park Research Strategy aims to connect research and management in the Park. It sets out research priorities and encourages collaboration across research disciplines that will help inform management challenges in the Park. Good research is a vital part of tackling the big challenges in the Cairngorms National Park. We want to ensure that research is targeted at the management needs of land managers, businesses, communities and public policy priorities, and that the Park is an attractive place to do research which leads to a clear impact. We want to encourage research that is focused on the needs of the place, across scientific disciplines, with outputs that can be used by managers. The Research Strategy sets out our current priorities. In October 2015 over 70 researchers and managers gathered to connect research and management in the National Park. The presentations and outputs from that event can be viewed here. We are now working to develop these pages further as a research hub for the National Park that will help co-ordinate and share relevant research needs and outputs.